We offer Costa Rica travellers a special hotel near by gorgeous, untouched beaches, surrounded by a nature paradise. Our hotel Paraiso del Crocodrilo is located in Guanacaste, Sámara Costa Rica, on the turtle beach Buena Vista and near by the white sandy beach Barrigona. The Paradise of the Crocodiles is a little individual hotel which is the ideal starting point to get to know country and people. Discover Costa Ricas unique nature, see banana and coconut trees in our garden, become faszinated by exotic animals, relax on the beach and enjoy the sound of the waves. Our hotel provides comfortable apartments, rooms, restaurant, bar and swimming pool. 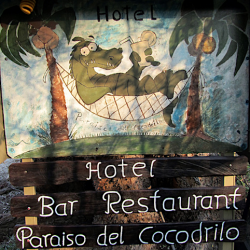 Who is searching for something special should visit the Paraiso del Cocodrilo in Costa Rica, Guanacaste, Sámara. Our hotel is located on the beach Buena Vista on the Pacific Coast side of Costa Rica, in the northern part of the country, near by the Sámara beach resort. Sámara has developed to a tourist destination for many tropic lovers. Not only the beach is easily to reach but also local attractiones like volcanoes and jungle are close by. Our location allows you to be in Sámara in a few minutes or to relax in our hammocks or on the calm beach Barrigona. Wheter you like to spend an active or a relaxed vacation – everybody will feel comfortable here. Spend your vacation in a peaceful environment, enjoy comfort and tranquility. Surrounded by a palm garden we offer our guests comfortable apartments and rooms, copious breakfasts, excellent dinners, a swimmingpool, a cocktailbar, guided tours, interesting people and a lot of information. Decide what is on your activity schedule – entertainment, sport and action or tranquillity, silence and privacy – we offer you everything and no matter what you choose, there will be friendly, helpful people around you. Welcome at our site – and have lots of fun surfing!